Last night as England beat Colombia in the World Cup John Stones “rose above the nastiness, the skulduggery, the crying, the whingeing, the play acting, the pulling, the pinching, the pushing” – “none set a better example than Stones”. So says the Mirror’s Andy Dunn. Or as the Daily Mail’s Riath Al-Sammaria puts it: “John Stones looked as though he might have left a little boot on Radamel Falcao”. 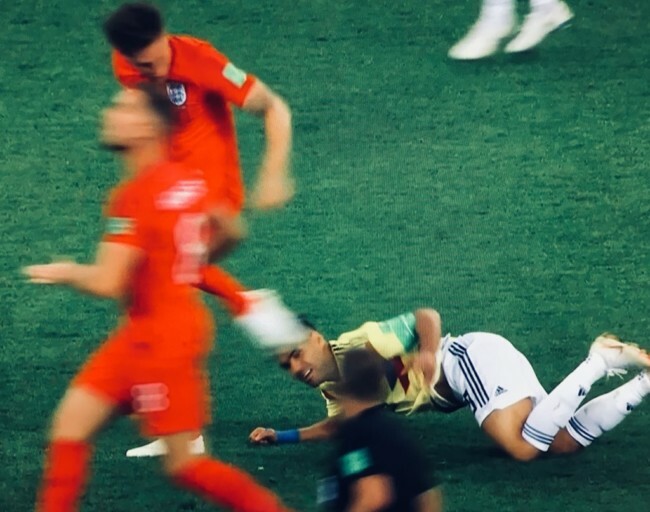 And as for the moaning, cheating Colombians, “Henderson held his eye when Barrios’ contact was with his chin” and “Harry Maguire dived for a penalty”. Former referee Graham Poll says Stones was “no angel and “caught Rademal Falcao in the head. Just seen a replay of John Stones dragging his left boot across a prostrate Radamel Falcao’s face on 60 minutes. Eyes on Falcao as he does it.